A series of "intermittent" closures has started on a cross-border bridge linking Scotland and England. It is to help take forward a bid for Heritage Lottery Fund support for the £7.3m Union Chain Bridge project. The bridge will be shut to traffic from 09:00 to 17:00 from Monday to Friday but will be open at weekends. 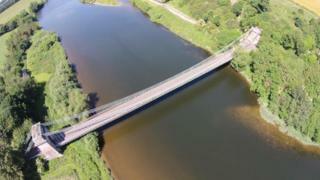 Pedestrians and cyclists should be able to use the bridge from the Borders to Northumberland at all times but may face some short delays. The closure is to allow work to progress on a project to conserve the structure which is nearly 200 years old.